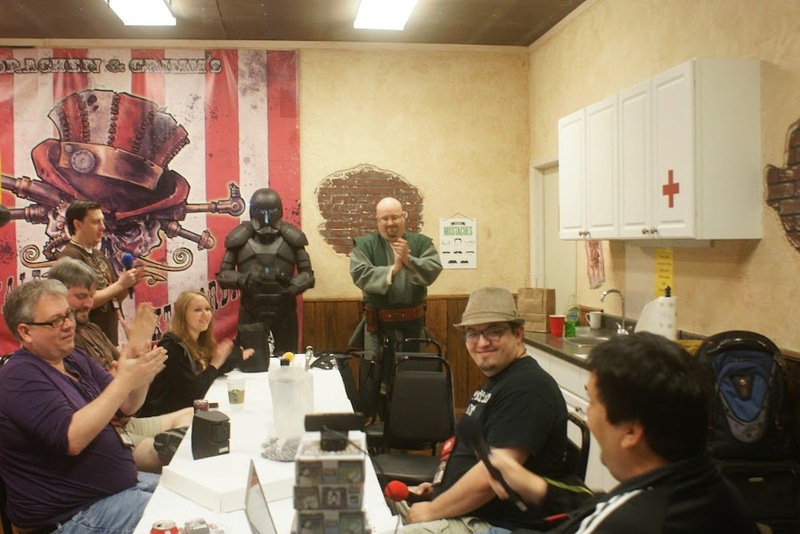 For my birthday, I took a trip to Denton, Texas to visit the offices and gaming store for Reaper Miniatures. Denton is the backyard for GM Dave and GM Chris, hosts of the Order 66 Podcast. 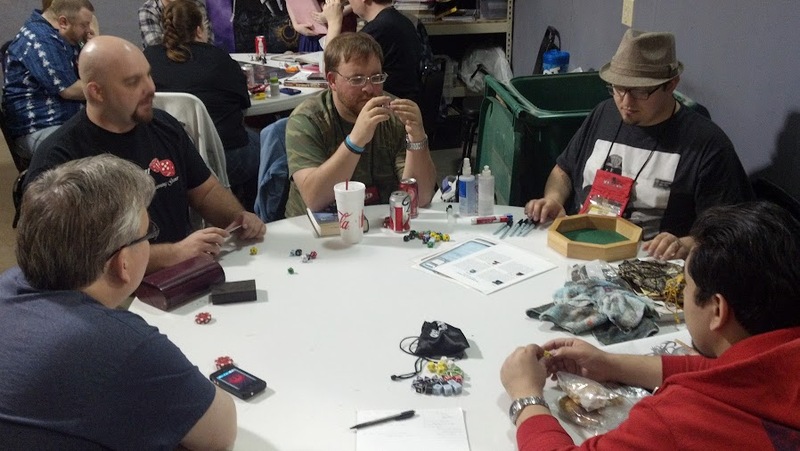 For the past few years, D20 Radio has flooded that convention running games and having a grand time with the folks from Reaper. Many listeners as well as the folks from Chris's various Star Wars games have some to Reaper and made it a sort of unofficial "D20 Radio Con". At Celebration VI this past year, I got to hang with Chris Bradshaw (a.k.a.GM Chance) from D20 Radio. We got him and his Republic Commando spot-approvals so he could be in the big photo-shoot with the 501st Legion. While talking about various other conventions, and he invited me out to Denton for Reapercon. I'd wanted to go since I heard about it when I first started listening to the network, and figured it would be a cheaper con to see the D20 Radio folks at than going to GenCon, so the plan started. Around about November another plan was put in motion too, but I'll go into that later. I left on my birthday; Thursday, April 18. Getting off the Logan express shuttle with my suitcase, computer backpack, and duffel bag. The suitcase got checked, which contained clothing for 5 days and my Jedi Knight outfit. Also crammed in there is my 24" short-blade for my lightsaber. The lightsaber itself was in the duffel bag; I didn't trust it going through checked baggage screening and it not getting damaged by TSA agents. This was 3 days after the Boston Marathon bombings; if I'm a TSA agent and I see a bag go by with a metal cylinder with wires in it, I'm going to search that bag. Now I've got some TSA agent showing all his buddies the lightsaber he found in some nerd's suitcase, and blinding his buddies with the high-power blade-LED because they don't understand how bright Rebel Star LEDs can be. So I've got it in my duffel and I get up to the first person at Security; the woman who checks boarding passes and licenses. I let her know I'm a Star Wars costumer, on my way to a gaming convention in Texas, and I have a replica lightsaber in my bag and want to declare it. Explaining that it's a 16" long metal tube, she gets an odd look of "that could be used as a weapon" across her face. I suppose it could be, because that's exactly what I want to do with my custom and very expensive lightsaber prop; bludgeon some stewardess and try to take over an AirBus A320 with it. Maybe I could blind the pilot when he looks through that peephole on the cockpit door. She asks me to place it in the bin on the conveyor, and tell the next TSA agent about it. They might want me to check it with my luggage. I shrug, and I get to the next guy, an older gentleman with a blue-collar look about him (a little rugged, a little surly, but mostly business). I let him know about the lightsaber, and my travel plans. He looks at it, ponders for a moment, and then says the Supervisor should probably take a look at it. I head through the body-scan machine, and the supervisor comes over. The supervisor looked about my age, and heads over to the x-ray viewer for the conveyor. I can tell exactly when my tray passes by when his eyebrows pop up and he get's a small smirk on his face. The tray comes out, and he asks me to get my other belongings and come over to him when I'm done. "Take your time!" he says. He heads to a test counter, and I get my stuff and go over to him. By then three other TSA guys are standing there and a fourth is called over "Dude, you're gonna love this, get over here." After a brief period of several exclamations of "DOOD!" and "Sweet! ", the quick demonstration of the lights and sounds of my saber, and the cursory confirmation that there are no explosives in it, I'm allowed to move on with the saber in my carry-on. My flight was supposed to leave at 1:05. The plan was to arrive at 4:30, get a quick bite, and head right to Reaper to play in a Star Wars game run by GM Chris. At noon, we were informed our flight was delayed. At 1pm, we were told that our original plane was taken "Out of Service" and a new plane was on it's way from Orlando. It wasn't going to arrive until 2:45. 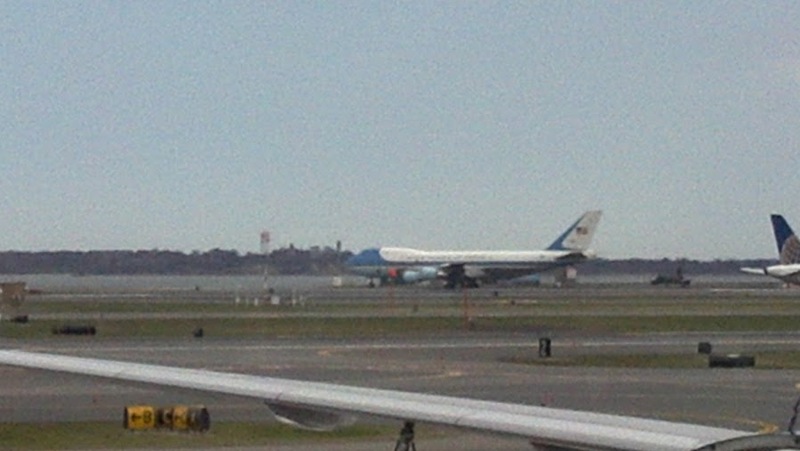 Figure at least a half hour for it to deplane, load up our luggage and passengers, and get moving. Oh...and we had the announcer come on, asking for someone to please claim a black backpack that was left at the counter. THAT request got everyones attention. Thankfully, a nice lady did. Swiftly. I got to Dallas at 7ish. Went right to GM Chance's place and got settled in. GM Chris, his wife Krista, and GM Dave showed up soon after and started pulling out Edge of the Empire books. I ended my birthday hanging with the folks from D20 Radio, playing Star Wars. I have to say if you're looking for a great little gaming convention to go to, Reapercon 2013 is it. I've been to some of the bigger conventions, like Origins, many times. 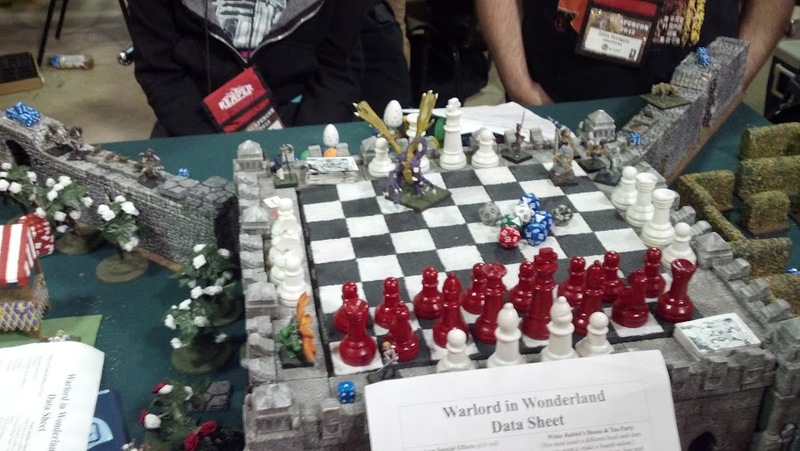 Reapercon is a fun little con of a few hundred attendees, and has a real family feel to it. It helps that a good number of D20 Radio folks are there so it feels like you're coming home to old friends. I got to play GM Chris's new Convention Module Series, Enemy of my Enemy. It's actually available for download on the D20 Radio website. Any of my PCs who want to play it should probably stay away, but for folks who want to run it go and give it a read. Maps used are available from Chris West's Maps of Mastery site, or you can use a white board to reproduce or your imagination. I do like Chris West's maps, tho. They're pretty. GM Chris runs a mean game, and has a snazzy hat! As a review, Enemy of my Enemy is a wonderful tale of mystery, adventure, and difficult moral choices. Don't worry if your character doesn't have a skillset for combat (assuming you use the pre-gen characters). Look at what you're good at, then look at the environment to see how you can contribute to the encounter. You get XP for survival, not for opponents defeated. I got to play Tyrix the Gand, who had disgraced himself in the eyes of his society so he only referred to himself as "Gand" (it's established Star Wars canon; look it up). A tech and slicing god, I was searching for computer terminals and machines to play with in every situation. Reapercon 2013 represents the first time I've been able to play in an Edge of the Empire game. It's also the first time I've been able to play in a Star Wars game since my brother failed to finish his Dawn of Defiance* module series. It's funny, I found myself willing to skip right into danger, and where I thought the Game Master expected the module to go. Maybe I've spent too many years as one myself. I got a sense of where we needed to go to continue the adventure. I could see some players at the table really getting into the persona they perceived for their character to have, but I found myself looking at the game going "what actions move the plot along" and trying to figure out how to get there. Maybe that hurt my character's role playing, but it kept the game moving. Back at Celebration VI, I met Chris Bradshaw from the D20 Radio network and became fast friends. We made idle plans for me to come out to Reapercon the next year (because GenCon was likely off the table). 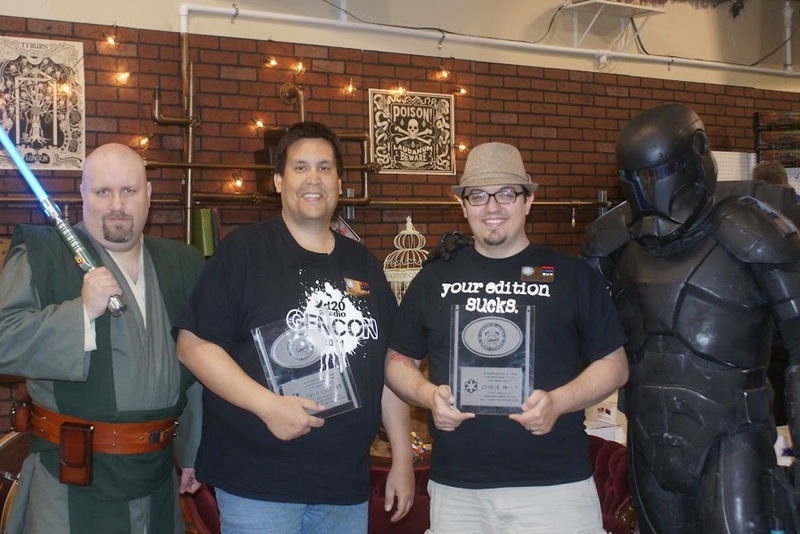 Sometime around October I was on the D20 Radio forums, and saw Zrissa's post about Jon Stevens being inducted to the Rebel Legion as a Friend of the Legion. Jon wrote material for two of the Saga Edition books. Thinking things over, I looked at all the work GM Chris and GM Dave have done with the Order 66 podcast, and how the Gamer Nation really flourished under their banner. Checking the Legion rosters, other podcasts have been inducted as Friends of the Legion (since Chris and Dave haven't worked directly on a Star Wars product, they would be eligible as "Friends of" not "Honorary Members"). A plan was put in motion. 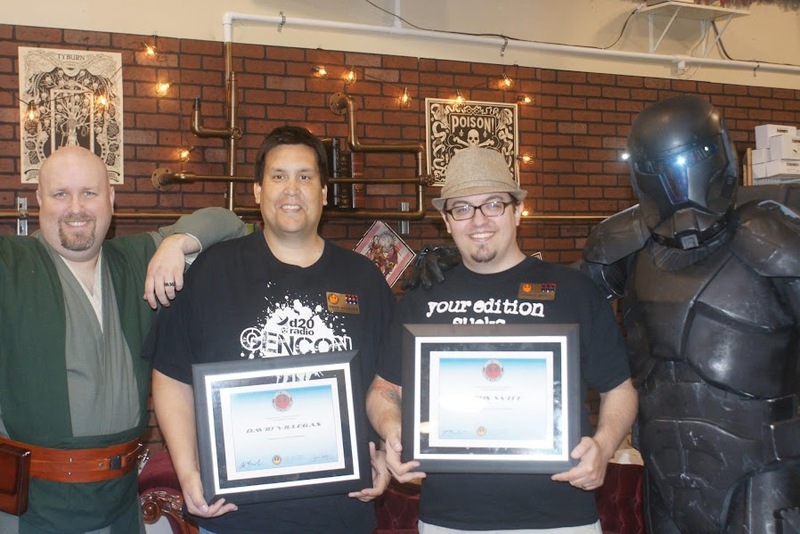 A petition was sent to the Command Staff of the Rebel Legion, and to the 501st Legion founder Albin Johnson to approve the induction of Chris and Dave into the Legions. The requests were approved, and the plans for the ceremony were put into motion. While GenCon might be a large venue for an induction, I was going to be at Reapercon. Bradshaw would be there, so there would at least be one other member of the Legion(s) in attendance. There was a period of nail-biting after I booked my airfare and con ticket that Dave wasn't going to be at Reapercon this year. Thankfully, the trip he was planning was delayed a month and he would be in attendance. I surprised Chris and Dave mid-live-broadcast by excusing ourselves and returning a while later in full costume, presenting the induction awards to them live on the air. Sadly, JustinTV has since dropped the visual recording (possibly to return in 14 months) and the audio from the episode was a little tough to listen to . It's one of the many hazards of recording with a different computer, like a laptop; it likes to be "helpful" when you plug in cameras and records off the camera mic instead of the 4 good-quality microphones. At any rate, mission accomplished, GMs humbled and giddy all at once, and forever supported by the 501st and Rebel Legions. Given the time and opportunity (and funds), I will return to Reapercon sometime in the future. Maybe not next year, maybe not the year after, but soon. I'll bring a game to run, or run one of Chris's modules. And it will be awesome, because I'll be hanging out with friends from D20 Radio and Gamer Nation. Next week, I'm thinking of returning to the subject of gaming. Star Wars Gaming. I think I've got an interesting exercise ahead of me and need to get it going. Until then, be safe everyone. …anyway, so I wrote a post, didn’t finish, and didn’t post that week. Disney takes a lot out of you, and I really didn’t have the time that week to finish up the post and get it up. That was the end of February. Today is different. I’m off on an adventure, and it’s my birthday. So my birthday gift is to write up a blog post for you all! 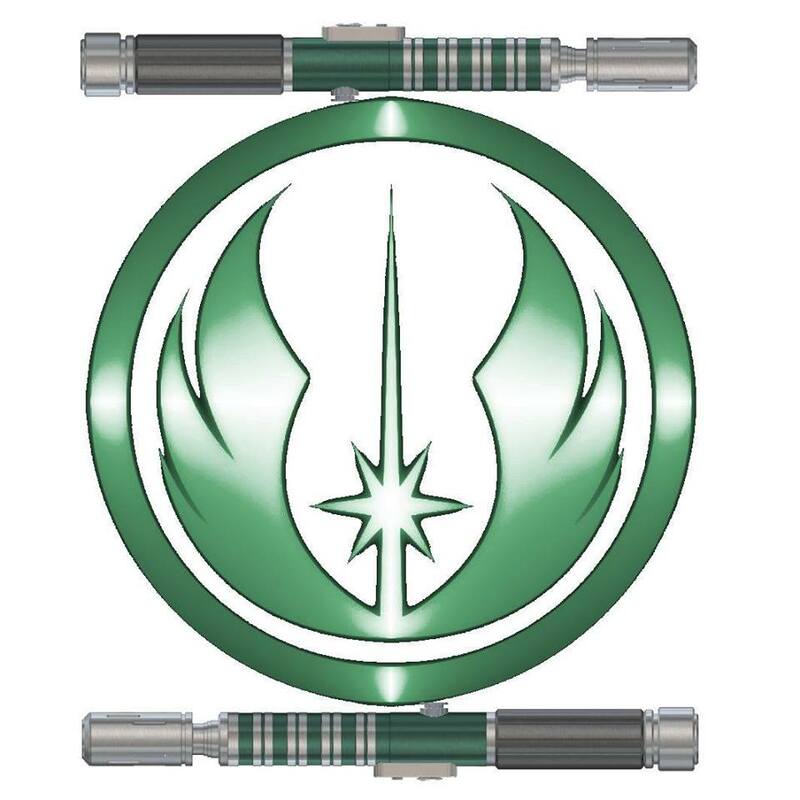 So my personal big-news of the week is that I finally have joined the ranks of the Knights of the Jedi Order; at least, the group with that title in the Rebel Legion. My “Generic Jedi” was finished and photographed by my lovely wife. I’d wanted to sew much of it myself, but once the project really started to get going, I knew that I would not be able to finish it in time nor be able to do it anywhere near as well as my wife could. Generic is such a poor term for the costume. I mean, sure; it’s not a “Face” character. It’s a costume based on the pattern of outfit the Jedi wear, but with colors and styles that are unique and personal. Many do the typical outfit; earth-tones in the brown spectrum. But a large number do things differently; they use deep blues, or greens, or crimson and maroon shades of red. They use more interesting, subtle tones, and include embroidery or graphics printing in their costume. This is where I wanted to take my Jedi. I’m glad the Preacher boots worked out. I love the pouches Nick Perry from R.H.Mardigan made for me. I’m thankful that my Jedi Food Capsules arrived in time to submit for approval. I’m glad the covtech knob on my lightsaber is just far enough to one end that the lightsaber hangs tip down (I was worried it would be centered, and more likely to spin in the clip-mount like a propeller). So what does being a “member” of the Knights of the Jedi Order mean, as far as the Rebel Legion is concerned? It means I can get the exclusive KJO swag, for one. (They’ve got a neat 5-year Anniversary Challenge Coin in gold that I’m drooling over. ) It means that I can be nominated for Detachment Leader at election time. It means I get to be in the KJO photo shoot at the next Celebration, assuming I bring my Jedi (here’s a hint; yes, I’ll be bringing my Jedi to C7). I think it also means I could become a Jedi Costume Judge, if my interests lie in that area. Regardless of what I want to do with it, I’m happy to have a finished Jedi, to be a Jedi Knight, and to have yet another “Legion Approved” costume in my closet. It's a fucked up world we live in. Sorry for the harsh language. I try to keep this blog as curse free as possible (for the childrens! ), but every once in a while my filter gets stuck. Every now and then I'm mesmerized by the news, entranced by the drama of it all, overcome with a macabre fascination of the happenings in the world. Base, crude language is sometimes all I got left. I don't want to make any false claims; I don't know anyone who was there and injured. All my friends who were in Boston are home with their families tonight. I'm not a witness, other than through TV and the Internet. I'm not a victim, other than the feeling of "I've been there. I've walked that street." My father worked in the Prudential Tower, which is right across the street from the bombings, for most of my childhood. I'd gone into see him or other events in that complex many times, at least once a year. Recently, I've been there for Boston ComicCon, which is held at the Hynes Convention Center two or three blocks west of the bombings. I've walked down that side of the street more than a few times, and I'm familiar with that area. It's all surreal to see it in the aftermath; blasted out, litter everywhere, stained concrete sidewalks. I want to say "this doesn't happen here, this is Boston"; but it did. In the weeks ahead I'll remember the attack, but I'll remember the courtesies. I'll remember the news cameraman who was filing as the bombs went off, who ran to the first blast site and kept his camera aimed just above the injured. We didn't see the injured, their grievous wounds. He wasn't overcome with the sensationalism of news media today; he was covering an important story in a respectable manner. I'm thankful for the producers and editors of the Boston news outlets who showed the human toll by focusing on the injured who were going to be okay. The ones wheeled away with injuries, but comparatively minor ones. I know there were victims who lost limbs, and their lives, but I didn't see them. Nor did I have to in order to "understand the grave nature of the attack". I salute the Governor, Mayor, and Commissioner of Boston who I'm sure wanted to throttle every single news reporter at the press conference who wanted "their quote", their "buzz word", their moment of "State Officials said to panic, so keep it here or you might get killed!". They kept their cool, refused to give in, and barely acknowledged any reporter with an agenda. In the coming weeks we will find out more about this attack; who's responsible, and the steps necessary to bring them to justice. We'll see the power of technology, and the thousands of cameras and camera-phones that were recording the event helping investigators find those responsible. We'll see the depravity of today's fear-based news media, but also the power of the human condition and the compassion of humanity. We'll see the opportunists, and the philanthropists. We'll see the villains and the heroes. I'm glad my Jedi got approved this week. I'm glad I get to be a hero, even if it's only a costume. It means I have another reason to head out to events and do what I can to support the real heroes in this world. 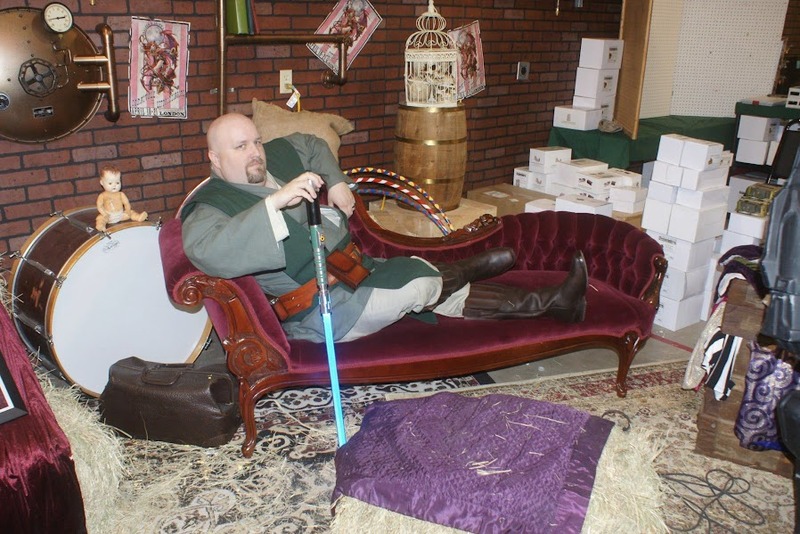 See you Thursday, where we'll return to our previously scheduled blog on Star Wars Gaming and Costuming. Until then, keep being heroes. So Thursday the 11th came and went without a blog-post update. Honestly, I have no clue what happened other than an unusually rough week at work mixed with some frantic costume-fitting with the wife. I promise this Thursday will be a much more interesting blog update. And not just because it's my birthday. It's A Bench. For Working On. Welcome to April; a month that's traditional been pretty hit or miss with me. It starts on a day dedicated to fools, has a birthday for me and my father in the middle, and ends with the promise of great outdoor weather. Unless you live in New England; in which case you might get rain, sun, wind, or snow. Pick two. As I look at my yard out my library window (read as "room where all my nerd-crap and books are stored'), see a large yard. The wife has plans for the yard, good plans involving pergolas and garden beds and the like. I'd just like a broad surface around three-and-a-half feet off the ground to work on projects at. Smelly projects that likely will end with me fumigating the house and my wife wanting to kill me. Plus, having such a work bench would make it easier for making pergolas and cutting lumber for garden beds. I need a work bench. An outdoor one that can handle rain and New England snow for at least a few years. Browsing around the internet I've come across some interesting designs. 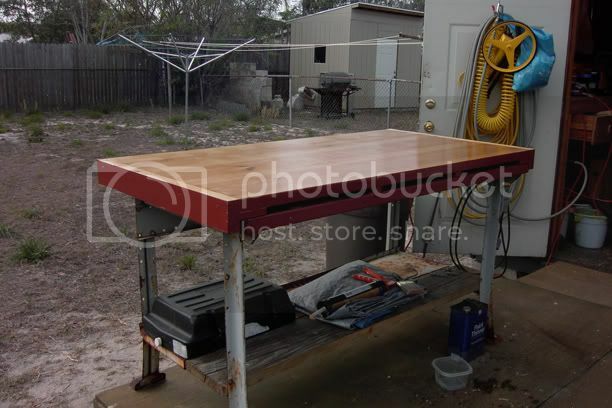 I found this one where a woodworker chopped down and reinforced an existing workbench. Seems pretty simple, and something I could likely construct pretty cheaply. Well, cheaply until I start adding in the cost of a miter chop-saw I'd want, and a new reciprocating saw because the one I got on the cheap from Harbor Freight died on it's second use. Hey, at least it was cheap. really ties the yard together. This one's an even simpler design, without any additional braces or supports. Not sure I like it, tho. The first one has a sort of aesthetically pleasing form. The braces make it more sturdy, and even with 10 deck screws holding the 4x4 legs, I'd be worried about the legs getting loose. I guess the biggest think I need to think about, after cost, is figuring out when I'm going to put this all together. Theoretically since the days are getting longer I could put in an hour or so during the week on this project. I'd rather bang it out on a Saturday or Sunday, but who knows how many of those I have in the coming weeks. Then again, a quick check of my calendar shows that Sunday is open both this weekend and next weekend. Maybe I'll swing by The Orange Despot and start pricing parts. I'll try and have pictures of my progress, because watching me with a miter saw might be fun. I'm sure my insurance company will appreciate the evidence too. This wasn't much of a Star Wars post, that's for sure, but it is something that will allow me to get some more work done on my Star Wars projects. I know a Jedi belt that needs some dyeing done to it, and I'm sure my wife would appreciate it if I didn't use the coffee table in the living room to do it.